Tweet A Mommy Squad friend, Sarah, recently made these adorable cupcakes for her daughter's 2nd birthday party. How cute are they!?! And here's how you make them. 1. Bake any kind of cupcakes you want. Use Wilton red cupcake liners. 2. After the cupcakes cool, frost one cupcake with a thin layer of frosting. I used white. 3. Use half an Oreo to make the mouth (stick into frosting). 4. Use two large marshmallows for the eyes. Cut a little bit of the edge off each one so they'll stick together. Stick both marhsmallows into the frosting. 5. Use an orange peanut M&M for the nose. 6. Fill in the rest of the cupcake using red icing and a Wilton star tip (#21) to make the fur. 7. Finally, put a dot on each of the marshmallows to make the eyes. I used canned chocolate icing and Wilton tip #5. Do you think the Birthday Girl, Allie, liked them? Sarah also put together these super cute, and super quick and easy cookies for her daughter's school buddies to enjoy. 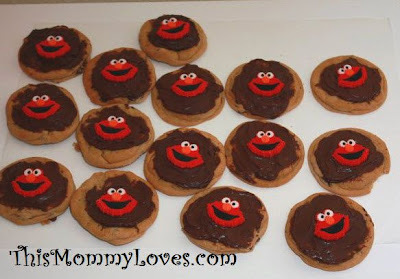 The Elmo's are just the pre-made peel and plop hard icing ones you can get at Walmart or Michaels. I love this idea for school treats. Way to go, Sarah! Thanks for letting me steal share your ideas. This post is shared at the following Link Parties. I love getting creative with baking! We did a pink alligator cake for Averee for her birthday after finding out how much it was going to cost to have someone else do it! Thanks for sharing this! I'm sure it is only a matter of time before Averee falls in love with Elmo! 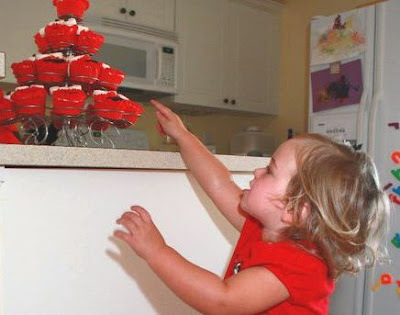 This is so cute and sounds very easy to make! Anyone would love seeing these! Thanks for the great idea! My son absolutely love elmo. I am visiting from "It's So Very Cheri." Thank you for sharing these Elmo ideas! I have four children, and my 2 year old loves Elmo, and I'm sure baby sister will too! Love it! Now I know what theme I'm doing for my daughters first birthday in January! Thank you! My baby would love these! i love the oreo mouth. I've always been too scared to make cupcakes that are actually supposed to resemble something, but these are just too cute. I think I'll have to try this soon. These are both adorable ideas! I love the one about taking the pre-made candy characters and adding them to cookies...so clever! Those are super cute! Looks like your little one was anxious to grab one! Thanks for sharing on Blog Party and don't forget about Cupcake Tuesday on HH today! So cute! Visiting from its so cheri. Those turned out amazing, seriously! Wow- those look delicious and too good to eat all at the same time! Great Job! 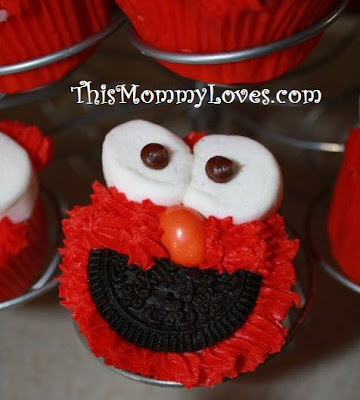 Awesome cupcakes, my daughter loves elmo and she will be getting thos for her birthday. Poor thing has a B-day on X-mas!! These are so cute! I have a little nephew that loves elmo! I will have to attempt these for him. I would love it if you would share at my link party too! Adorable cupcakes! Thanks for sharing at Anything Related! Thank you so much for posting this! I made these for my daughter's second Birthday and they were an absolute hit! I'm hoping to make these for my son Jackson's 2nd birthday party this weekend. My girlfriend sent me this link and I'm super excited to try it + know your blog! I'm also curious about what frosting you used. Would you mind sharing? my daughter Aubrey loves Elmo and cupcakes haha. Perfect!